Will Digital Wallets Die Once UPI Kicks Off Holistically? Raghuram Rajan will be remembered for more than just one big reform in the history of the Reserve Bank of India. If it were not for the government’s ground efforts along with the efforts of Rajan-led RBI, ushering the Digital India wave would not have been as easy. During this era of a revolutionary change in the country as it embraces e-transactions like never before, laudable are the efforts of digital wallets providers. But what is more laudable is what the RBI already has in place for online payments and transactions. The RBI launched the Unified Payment Interface in April of 2016. The UPI is basically an app that enables instant, online bank payments. It is stewarded by the National Payments Corporation of India – the umbrella organization for all retail payments systems in India. What it does for a consumer is provide them with an ID, which can be used to select the amount beneficiaries want to transfer and confirm the payment via a mobile pin. The payments system is designed to serve as a replacement for all the applications that a consumer needs to make money transactions online. Once consumers are glued on to UPI, they can skip online banking systems entirely. Consumers do not need to punch in any of the usual debit/credit card numbers and details such as expiry date, CVV code and a password. The whole process of adding beneficiaries onto accounts and punching in details such as the IFSC code, bank account number et al will also turn obsolete. The biggest advantage that UPI offers as offered to banks offering online banking on e-portals is that any bank’s systems can be used on UPI to make payments or transfer money. There is no limitation of having your bank listed on the e-portal hence making it hassle-free. 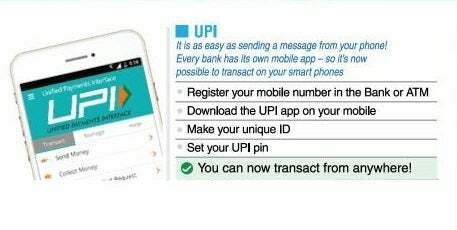 Also, unlike RTGS and NEFT, UPI app can be used to transfer funds 24 hours. Unlike banks, UPI also offers a payment range between Rs 50 to Rs 100,000 in one transaction. UPI could be a game changer when it comes to cash on deliveries. The company delivering products could use their UPI ID and consumers paying for the delivered items could pay via their UPI ID or a bar code. Dilip Asbe, Chief Operating Officer at National Payments Corporation of India, believes the B2B usage of UPIs is more than theB2C use currently. Speaking at the India Fin Tech Awards, which was supported by Entrepreneur India, Asbe said NPCI is envisaging a growth of 4-5 million users next year. According to media reports, 26 banks are a part of the UPI network including India’s largest private bank ICICI Bank, Axis Bank, YES Bank and government banks such as Punjab National Bank and Andhra Bank which will all soon come under one umbrella of the State Bank of India. Now when the country is being forced to adopt technology with open arms and move to digital payments systems, it could be tough to say if digital payment wallets will completely die once UPI kicks off holistically. Vijay Shekhar Sharma-backed Paytm said earlier in November that its platform saw a 435% increase in overall consumer traffic. Another popular payment wallet MobiKwik said it registered a 40 percent growth in app downloads within 18 hours of INR 500 & INR 1000 notes pullout. Many smaller players have joining in the wave to cash on the opportunity a Digital India can provide. The success of UPI will depend on how fast the technology is adopted by more businesses and consumers and how well it gets advertised by the government. Whether UPI will wipe out all of these small and big fish remains to be seen. For now, it is an app that is yet to see its bloom but with hope of a bright future.